Welcome to the Bruner Lumber Company! Located in Northwest Florida, ten miles south of I-10 in Ponce de Leon. 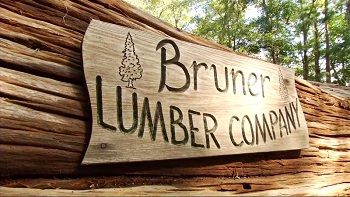 Bruner Lumber Company has specialized in River Recovered Sinker Cypress and Sinker Pine for over 35 years. Today we’re one of Northwest Florida and Southern Alabama’s leading Reclaimed Cypress and Pine suppliers, providing beautiful custom lumber products and services to our customers across the U.S.
Finding recovered timber that was harvested hundreds of years ago helps preserve our current forests and provides you with an extremely high quality, durable, and beautiful lumber product. However, unlike many other lumber companies out there, we recover much of our lumber ourselves, which includes Sinker Cypress, Sinker Pine, Pecky Sinker Cypress, Curly Sinker Pine, and Sinker Cypress Wide Cut Slabs. Our experienced divers are continually searching the old logging waterways of Northwest Florida and Southern Alabama for the deadhead logs that produce the beautiful wood we’re able to offer to you. Our customers have been choosing us for more than two-and-a-half decades because in most cases we’re involved in the process literally from start to finish. Bruner Lumber Company is one of the few lumber companies around to not only recover our own sinker logs, but also mill and dry nearly all of it on-site. And our team mills each log with care and precision to meet our customer’s specifications. What this means for you is that we can offer you true “mill-direct” pricing, because we’re not a middleman or a broker. Whether it’s a large construction order, or a single beautifully prepared mantelpiece, you can be assured that we’re involved in the process from the moment we acquire the specialty log until the final lumber product reaches you. We were featured on television! The producers of the Florida television show How To Do Florida contacted us to ask if they could feature our operation in one of their episodes. They’d heard that we were experts in deadhead logging and needed our help! The host, Chad Crawford, wanted a mantel for the fireplace in his personal home, so he decided to find out for himself what it takes to retrieve a deadhead log and mill it. He discovered that there’s a lot more involved in the process than he had imagined (including danger)! We have a post about the show here on our site. 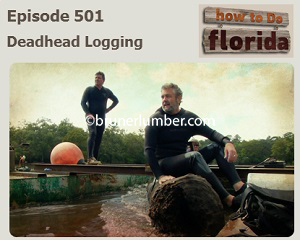 We show you a little bit about what Chad discovered on his Deadhead Logging adventure! Whether you’re just down the road from us in Northwest Florida or on the other side of the United States, we can arrange shipping of our specialty lumber direct to you. If you’d like to see the quality of our lumber for yourself, we offer a sample package for $30. Visit our Ordering & Contact Info page to request one. We want to thank you for stopping by. We’re a down-home company, so we sincerely appreciate our new and returning friends and customers. We come from a place where keeping our word is important and we make it part of our business. If you have any questions or comments, we want you to let us know. We hope to see you again soon!